The 3Doodler Create is the latest generation of the world’s best selling 3D printing pen. Replacing the 3Doodler 2.0, the new 3Doodler Create incorporates 100s of refinements, for smoother, faster, and more reliable Doodling in 3D. Now branded as 3Doodler Create to capture the amazing versatility of the world’s leading 3D printing device, the Create is perfect for fine art, DIY, maker projects, creating scale models and decorative items. WORLD’S FIRST AND NO. 1 BEST SELLING 3D PEN: 3Doodler Create is the newest model from the maker of the world’s first 3D printing pen. The slimmest, lightest, strongest 3Doodler yet. Enhanced design, easy to manage, and improved drive system for quieter and smoother operation, and endless creation. Latest features also include simplified and intuitive controls, and a new ambient light bar. DOODLE IN 3D: Draw vertically. Draw horizontally. Lift your imagination off the page! The 3Doodler Create extrudes heated plastic, which instantly hardens, allowing you to literally draw in 3D, freehand or on paper. Change colors quickly and easily. The possibilities are endless. 3D ART MADE EASY FOR ALL ADULTS: From hobbyists to crafters, artists and professionals, 3D creation has never been easier. It’s the perfect gift for all men and women. Precision crafting and art is easier than ever with the ultimate 3D craft pen. MOST VERSATILE 3D PEN: 3Doodler offers the widest range of plastics, no mess, safe and non-toxic. 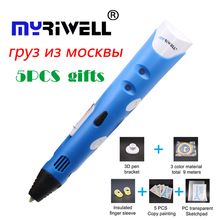 It’s the only 3D Art tool with changeable nozzles and unique accessories. Plus, you’ll find hundreds of FREE 3Doodler stencils available online for family friendly inspiration. Draw in 3D for hours! NO RISK PURCHASE, COMPLETE 3D SET: 360 days FREE replacement policy and unrivaled 24-hour global customer service. THE BOX INCLUDES: 3Doodler Create 3D Pen, 50 FREE Plastic Strands in a selection of multiple colors and materials, Power Adapter, Quick Start Guide, Tools & a ton of creative potential!